In medical education, US clerkship for IMG or rotation refers to the practice of medicine by medical students during their final year(s) of study. Customarily, the first half of medical school trains students in the classroom setting, and the second half takes place in a teaching hospital and take an observership for IMG. Download, fill out an application and submit completed form. Submit transcript fee payment if the location you are applying to is requesting it. (If your application is approved your transcript will be granted automatically, there is no need to request this document in person). After you complete all the previous requirements and the School of Medicine has approved your application, a “Letter of Good Standing” will be issued and sent to the host institution. If accepted, the host institution will send a provisional acceptance letter to your preferred School of Medicine. Once accepted, submit payment of Malpractice Insurance (Malpractice Insurance payment is not refundable and this can’t be paid with your student’s loans). After you have fulfilled all the above requirements and have passed all of your courses, the institution will issue a clearance letter to the host institution. Host Institution will issue a final acceptance letter, and you will be able to start your program. Satisfactory completion of all courses with a passing grade in all previous semesters is first and foremost required. If the IMG has any pending courses, the application will be rejected. All students assigned to U.S. clerkship for IMG hospitals must be fluent in English. Any IMG who has applied for a transfer to another clerkship medical school IMG will not be eligible for these programs. Eligibility does not automatically guarantee selection. There will be a 30 days cancellation notice required, from the starting date, for all requested cancellation of rotations. The starting date is a final set date with no further chance of alteration. U.S clinical clerkship for IMG is often a prerequisite for IMGs applications to residency programs. Some programs have a minimum length requirement for this experience also (from one month to a year). If an IMG doesn’t do a clinical clerkship, it automatically narrows their choices of residency programs. It also helps in the process of taking USLME preparatory courses as it provides them already with an insight. It can provide letters of recommendation from U.S. physicians. There is usually great weight put on these letters in the selection of applicants for the interview and for the eventual match. Most letters of recommendation should ideally come from physicians within the specialty that you are applying for. It helps form contacts. Contacts can be a very important factor in helping you get residency interviews and then match. The more acquaintance the program director has with you, the better. This acquaintance comes from recommendations made by physicians who are positively familiar to the program director as well. It also helps IMGs understand the medical system as a whole better. It provides an insightful platform for students to have a perfect understanding of what is clerkship treating ailments and saving lives really feels like. Medical knowledge – By managing complex medical illness, your medical knowledge will enhance and will display an analytical approach to your patients and their clinical situations. Communication and interpersonal skills – You will demonstrate the ability to communicate clearly, respectfully and compassionately to your patients and their families. You will also develop effective listening and writing skills. Also, you will function effectively as part of the health-care team, communicating with fellow interns, your residents and other members of the team including case-managers, social workers, and nurses. Professionalism – You will demonstrate respect, compassion, and integrity when taking care of your patients. You will demonstrate sensitivity to issues such as confidentiality, culture, age, sexual orientation, gender, and disability. Patient care – Clinical and management skills you will perform thorough and appropriate histories and physical examinations and any necessary procedures. You will make and carry out informed patient management decisions. Practice based learning and improvement – you will analyze your own medical practice on a case-by case basis and apply knowledge gained in the care of future patients. Systems based practice – You will gain understanding of types of medical practice and healthcare delivery systems and how they impact patient care. Core (required) clerkships are not permitted in Florida medical schools or clinics unless the foreign medical school is licensed for that purpose by the Commission for Independent Education. There must be a specific written agreement between the medical school and the accredited hospital for the specific core IMG applying for US clerkship, in addition to many other standards that must be met. Current rules permit students of foreign medical schools, not licensed by the Commission, to participate in an occasional elective clinical clerkship (occasional means no more than 3 students from any one unlicensed foreign medical school in any calendar year, with each of the 3 students doing no more than 3 elective clerkships in Florida in any calendar year). Clinical clerkship for IMGs in California: – California Pacific hosts visiting medical students through various opportunities year-round, and has formal teaching affiliations with Geisel School of Medicine at Dartmouth College and UCSF School of Medicine. Available fourth-year electives: medicine, cardiology at St. Luke’s, gastroenterology, general medicine sub-internship, hematology/oncology, multi-specialty units (ICU or CCU), pulmonary, ophthalmology, psychiatry, radiation oncology, stroke/neurocritical care sub-internship. Applications must be submitted at least two months prior to the requested start date of the clerkship. Applications will be accepted up to one year in advance of the requested rotation date though decisions may not be made until 90 days prior to the beginning of the rotation. Medical Clerkship for IMG in Massachusets – The Harvard Medical School (HMS) Clerkship Program is one of the largest visiting student programs in the country. Annually, the HMS Registrar’s office processes applications for over 2,000 requests from students from around the world. The program is designed for medical students in their final year of medical school who wish to participate in clinical clerkships offered at HMS-affiliated teaching hospitals. You can also check out the clinical clerkship for IMG in NYC. The international medical graduate program is open to medical schools that have been approved by Harvard Medical School and have USMLE prep courses. A list of currently approved medical schools may be accessed at the online application. In order to be eligible for the program, applicants should meet all of the minimum criteria: be currently enrolled medical student in the final year of medical school (within 12 months of graduation); in good academic standing at an approved medical school; have completed satisfactorily the core clinical clerkship requirements comparable to HMS core (minimally, surgery, medicine, pediatrics & OB/GYN. Applicants applying for psychiatry, neurology & radiology will be required to have satisfactorily completed core clinical clerkships in these specialties if prerequisite to advanced elective); must be in compliance with HMS immunization requirements; must be fluent in the English language including conversation, writing, and reading; those already holding an MD degree, or its equivalent, are not eligible. Hence for the best assistance with your observership for IMG application, get in touch with our services. We offer features and assistance in writing, editing, proofreading, and formatting. 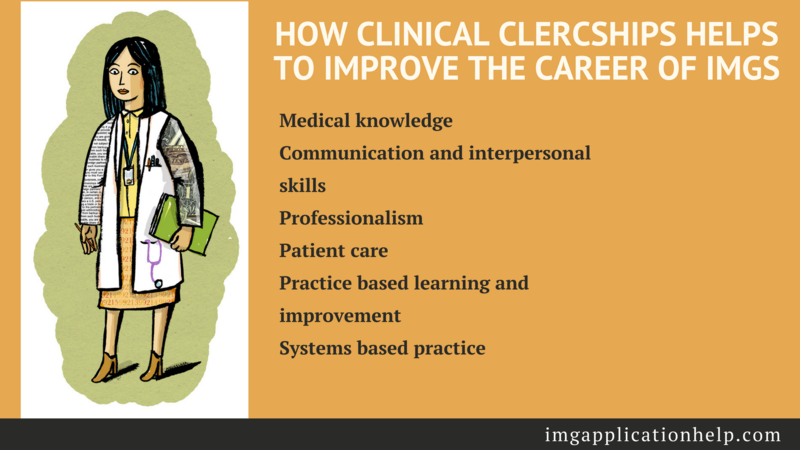 So get in touch with us today for expert assistance with your clinical clerkship for IMG application!